Melaleuca, or Tea Tree essential oil has been around for centuries. It’s a great all-purpose oil and is a must have in your natural first aid kit. There are so many uses for this oil, I can’t even list them all here, or it would take forever! It’s antimicrobial, antiseptic, antiviral, antifungal, an insecticide, and a stimulant. It helps the body fight off disease, bacteria, infection, virus, and illness. The list below is a great way to get started, though. 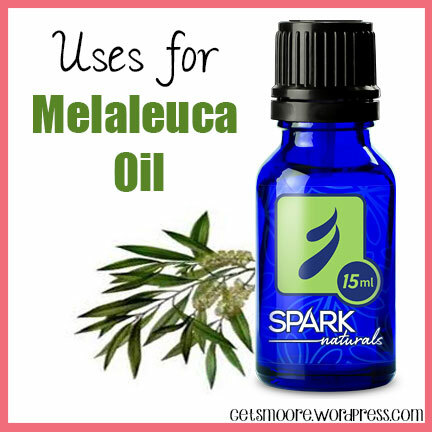 There are also many uses for Melaleuca oil in the home, but that’s a post for another day! As always, don’t forget to use the coupon code SMOORE to receive 10% off your order at Spark Naturals! Disclaimer: I am not a doctor; these are only suggestions for uses of this powerful essential oil. Please see your health care practitioner for medical issues.